It’s almost time for Spring Training, which means that Sony’s about to put MLB The Show 19’s marketing machine into gear. 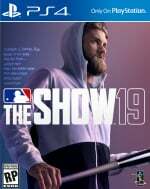 San Diego Studio’s taken to the PlayStation Blog to showcase the first gameplay trailer from this season’s instalment, which you may recall has free agent Bryce Harper on the cover. In addition to teasing various legends, there are a few new features hinted at in this trailer. For example, it looks like there’ll be a new “gym” component in Road to the Show, while it looks like you’re going to be able to customise your bedroom. Finally! More will be revealed in the future – for now just enjoy the hype video. Are baseball video games popular in the UK? Just curious. @NintendoFan4Lyf No. I like The Show, though! @NintendoFan4Lyf Are Cricket games popular in the US? @get2sammyb Well you also like American Football. I guess that makes you a Yank in a Brits body. @NintendoFan4Lyf I often wish I was born in America so I could have played wide receiver at high school. @playstation1995 The Knicks could do with some decent players, maybe you should take it back up again? @themcnoisy are there any cricket games? @ellsworth004 Don Bradmans cricket. They are just similar sports it's why I made the analogy. Baseball will never be popular here because of Cricket and vice versa. loved Baseball years ago though and rate it over Cricket. Again like Sammy I am a big fan of the Nfl and have been to Wembley to watch the 49ers vs the Jags 5 years ago in a season game. Gutted old man Drew Bledsoe never made the Superbowl it would have been a class game. Robbed I tell thee. @themcnoisy i like all sports but i know nothing about cricket. I would love to play one and learn about it. Fifa is how i learned all the rules of...er...football. As a recreation of its chosen sport, I don't think there's a better game than The Show. They are that good. I'm thinking I might pre-order this year. Does the Show even get a UK release these days? I had to import a PS3 copy as there never seemed to be any UK versions available. @ellsworth004 I wouldn’t imagine it would be too hard to learn football from Fifa. I watch the Super Bowl every year and sometimes watch baseball and I really don’t have much clue what’s going on. Good thing Scottish football is as simple/low quality as it gets. Tons of other educational videos out there. There are some similarities to cricket, which may help your understanding.